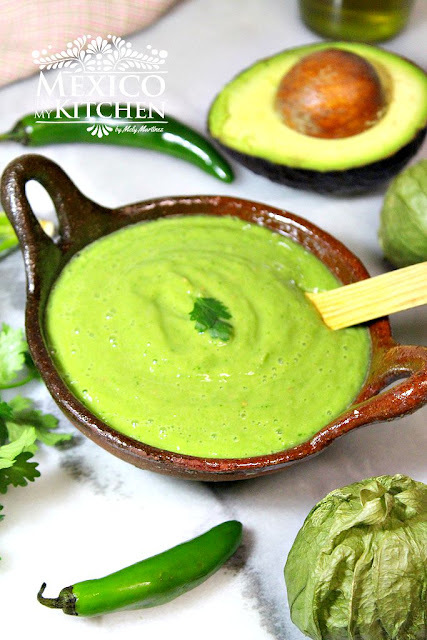 This salsa avocado green salsa is made with fresh ingredients and it is very common in central México, where it is used for tacos "Al Pastor" or other grilled meats. It's a very refreshing version of the cooked tomatillo salsa. In these hot days of summer it is an excellent companion for your barbecued steaks and an absolutely wonderful pair with pork carnitas. Other names for this salsa is "Guacamole Salsa"